17 ski runs and 7 lifts (including 2 chair lifts with magnificent views), make for one of the best skiing destinations in the area. If you want to run beyond the boundaries of the resort, you can arrange before hand for a small taxi to pick you up when necessary. 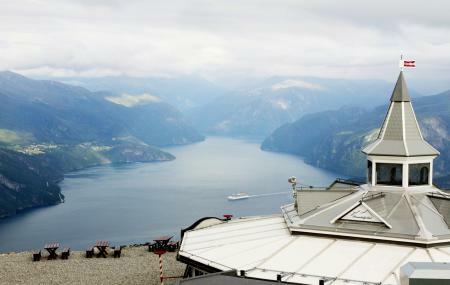 The top of the lifts has restaurants, and the view is breathtaking; there’s also a small gift shop. Everything is really expensive, though, including renting your equipment. There may be a bus from Alesund to Stranda. Ask at the tourist information centre. Prices given are for the Gondola rides. June 21 – July3: The Gondola is open every Saturday and Sunday at 12 pm to 17 pm. July 4 – August 3: open from 12 pm to 17 pm daily. August 3 – October 12 open Saturdays and Sundays from 12 pm to 17 pm. How popular is Stranda Ski Resort? People normally club together Liabygda Church and Rotsethornet while planning their visit to Stranda Ski Resort. Hard to get a better view! Unfortunately the conditions didn't allow us to get on any free riding from the peaks outside the regular slopes, but I imagine it would have been spectacular. Will try again. Beatiful! Nice ski installations and kind personell. Closes very early. Only one hour away from Ålesund. Stunning view and great skiing possibilities. Two thirds of the ski lifts were closed, but they still sold three hour tickets at full price (450 nok). Expensive to begin with and not worth the price when almost everything was closed. Ski lift broke down so couldn't visit to see the view! But got a free local delight snack break, so not complaining!